The Conjurer is a black and white, 1899 movie made by illusionist and filmmaker Georges Melies. Accompanied by a ballet dancer, George Melies performs a quick series of magic acts, including disappearances, reappearances, and transformations. Now with a mobile device and moviemaking app we can accomplish the same effects used in this film by making two minor edits in our timeline. The creativity is in the story that you create and the items that you make disappear! Films must be filmed and edited with a mobile device ONLY. The film must replicate the general gist of The Conjurer, which means you must make something disappear, or appear, or transform. Films must be under 45-seconds and will be judged for their creativity and story. If it’s available you’re encouraged to add a filter that creates the look of an old film, but it’s not required. Submission links must be posted below or shared on the Dads for Creativity Facebook page. 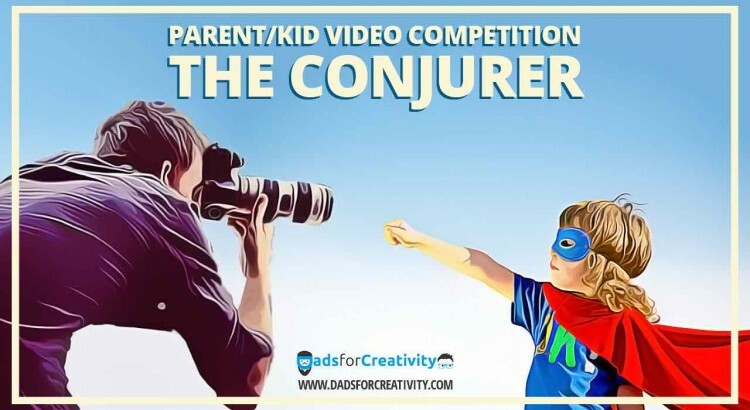 We also welcome submissions via Instagram (which has a 15 second cap), but you must remember to use our handle @dadsforcreativity and include the hashtag #TheConjurer. You can also view the entire film for free by simply commenting on one of our articles. Anyone who shares or contributes content via the comments below* will receive a FREE download to Creativity in Education: Exploring the Imbalance. If you choose to comment via social media be sure to sure to include reference to @dads4creativityor share from our Facebook page. We’ll follow up with details via a private message. When it comes to Kid Moviemaking Ideas, Lego Stop Motion is super, super high on the list. Not only does it allow our little ones to generate fun stories that can be easily captured, but it also extends the creative thinking to constructing worlds, and engaging problem-solving skills in not only the child, but parent as well. 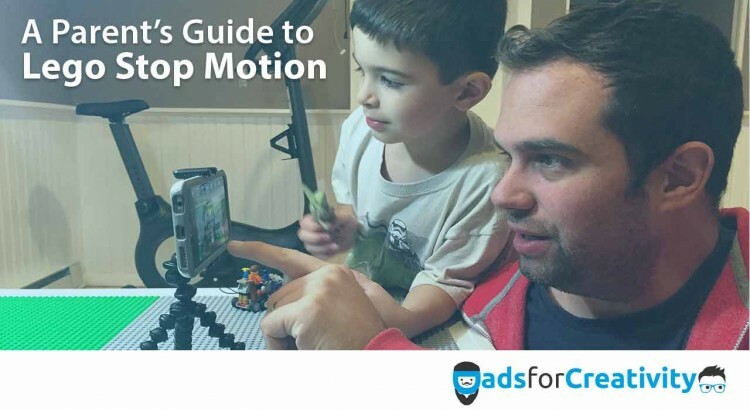 After fellow parent, David DiBartolo completed his Fine Arts degree he landed in the world of video, and now applies these skills at home with his son Drew. 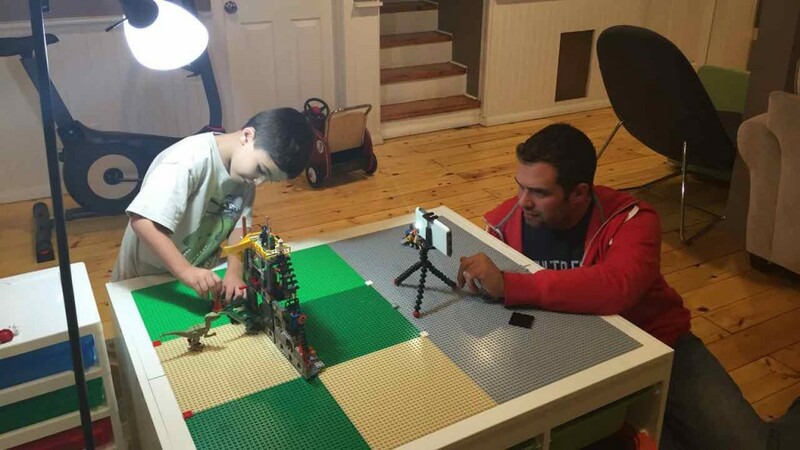 Below he shares some tips and tricks for parents looking to get into Lego moviemaking. Also, don’t forget to comment for free access to the film Creativity in Education: Exploring the Imbalance. How did you get into making Lego videos with your little one? When my son Drew was four he got his first Lego set, a Star Wars spaceship of some kind. I noticed he had some really imaginative play with just the ship and the three characters that came along. I thought it would be a great idea to film him and capture some of the great stories he was telling. As his/our passion for Lego grew we began watching some really great stop-motion Lego movies on YouTube, and it was Drew who suggested we try to make our own. Like any creative endeavor, it began very basic. I wanted to find a way to make it easy for a four/five year old to make his own movies as well as keep his attention so he doesn’t get board of the monotony of the stop-motion process. We had no lights or tripod. I chose the brightest room in our house and suggested we shoot on my iPhone as appose to the DSLR cameras that many of the YouTube videos are shot with. As for a stop-motion app, we landed on the “LEGO Movie” app. It has some canned effects, stock music, and a pretty simple UI for a four/five year old to grasp. Kid Moviemaking Ideas: Dave and Drew setting up a shot in one of their movies. Can you tell us a little about the Lego Stop Motion App? How easy is it to use? Do you need to know about Stop Motion and Movie Making? The “LEGO Movie” app is pretty simple. It gives you the option to chose your focal point, turn on the flash on your phone, and use it as a light. An “onion layer” option so you can see the previous shot for a fluid sequence. As well as some pre-canned effects and music to help make the post-production of the video a little easier. What advice can you offer parents looking to make Lego videos with their kids? Start simple and plan out the story before going into the shoot. Drew and I have a “pre-production” meeting where I try to limit his grand ideas into a simple story. He has a great imagination and sometimes imagines stories that would rival most summer blockbuster films. The best thing I learned is to give him rules to work within, otherwise he’d either get frustrated, or bored, and not want to finish – or we’d end up working all night! I have him choose a hero, a villain and some supporting cast. I also have him choose one location and work the story around that location. I ask him what problem his hero has to solve. If the solution begins to get a bit too violent I ask him what his hero could do to avoid the violence. Asking questions about his story really helps hone in on the core of the story he is trying to tell. I let him create the story I just guide him in a positive direction. Sometimes he gets really excited about his idea and I suggest we draw storyboards so when we go into filming I can refer to this so he stays on task. As for useful equipment, using a tripod and/or a studio light help. The main reason is to get a level steady shot and try to even out the light, so the shadows don’t get too heavy. Check out one of Drew and David’s films below. If you choose to comment via social media be sure to sure to include reference to #dadsforcreativity or share from our Facebook page. We’ll follow up with details via a private message. Submission links must be posted below or shared on the Dads for Creativity Facebook page. We also welcome submissions via Instagram (which has a 15 second cap), but you must remember to use our handle @dadsforcreativity and include the hashtag #TheConjurer. Provide any questions in the comments below. Moviemaking is great in the development of storytelling skills. Add magic to the mix and you’ve got an additional dimension for creativity to flourish. 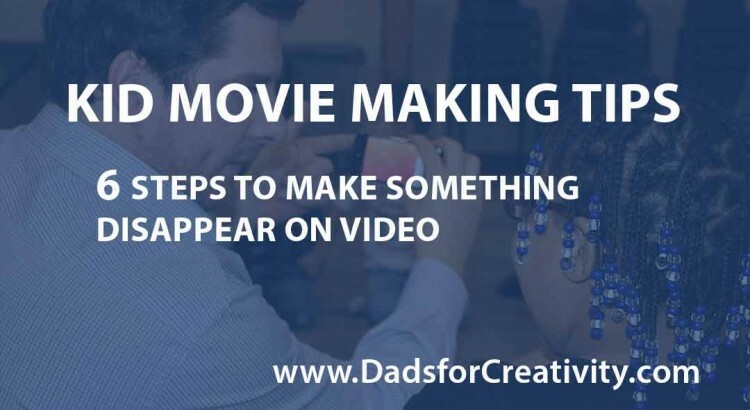 There are lots of kid movie making ideas out there, but the 6 simple movie making tips below are very easy to perfect and offer a nice final product once finished. The activity is also nice introduction to parents with little to no experience of filmmaking. Set up the magic trick. Practice how it will work. You will need a pause or as little movement as possible where you plan to make the cuts in the video. In between these two sections is what I refer to as ‘behind the scenes’ – the part where you physically remove an item from the scene. Record video. The simple way to do this is record the entire thing without stopping. It’s important to keep the video still, especially during the places where the ‘behind the scenes’ action begins and ends. This will be helpful in editing. Import entire video into a moviemaking app on an iOS or Android device. It might be wise to remove the sound if this is an option in your app, especially if you’ve been delivering instructions. 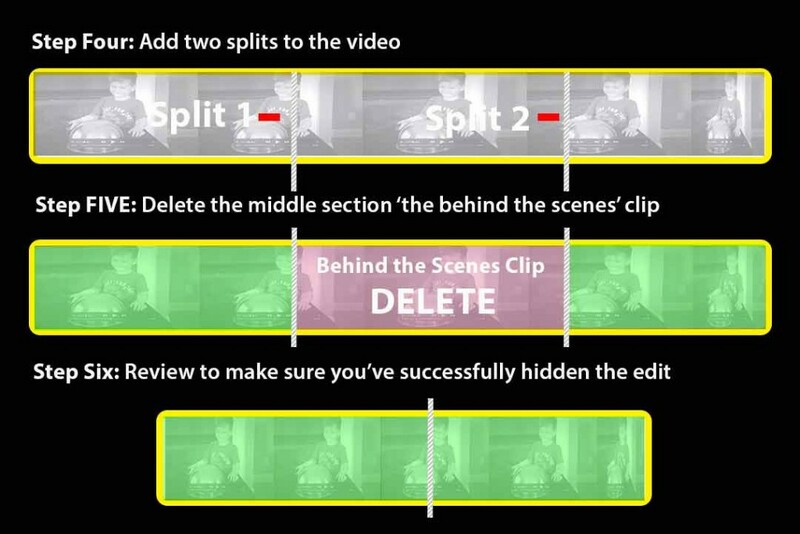 Add a ‘split’ (cut), to the video at the end of the first section where the trick is set up. Then add another split (cut) to the end section where the trick is revealed. The ‘behind the scenes’ clip should be in the middle. This is the part where you delete the ‘behind the scenes’ clip. Review to make sure the first clip transitions into the remaining clip without it looking obvious – this is why it’s so important to keep the camera steady during filming. Do NOT add a transition or effect between the two clips, as this will draw attention to the edit. Below is a behind the scenes look of our ‘The Conjurer’ video. This clip shows how we made Lucas disappear in his box, but it’s the same technique for making anything disappear. There are many kid movie making ideas, but this is one of my favorites. Perfect these movie making tips and you’ll be on your way to producing your version of ‘The Conjurer’ in no time. Export to YouTube, be sure to post the link below and share on our Facebook page. Anyone who shares or contributes content via the comment box below will receive a FREE download to Creativity in Education: Exploring the Imbalance. Information will be sent via email, and don’t worry this process does not subscribe you to our blog – for that you need to provide email details in the box at the top.